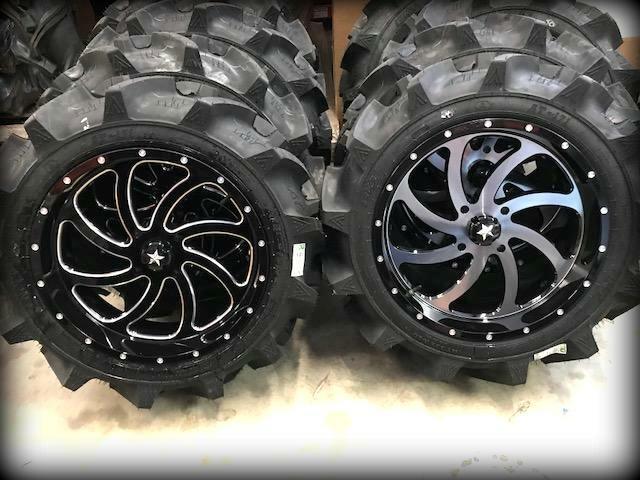 ATV Parts, ATV Radiator Kits, ATV Wheels Tires, ATV Suspension Springs Shocks Bumpers - Wild Boar ATV Parts > Big Wheel Kits > 33x9x20 BKT AT-171 Tire/Wheel Kit – Free Shipping! 33x9x20 BKT AT-171 Tire/Wheel Kit – Free Shipping! It’s no secret that the #1 tire on the ATV / UTV market is BKT. These tractor style tires have taken over the mud-riding market. They’re light weight, dig great in the mud, and ride smoother than most aggressive mud tires. The 33-9-20 BKT AT-171 has become one of the top sellers being as it’s one of the only 33″ tires on the market for a 20″ rim. Our tire/wheel package will come mounted and include your lug nuts. The best part? FREE SHIPPING!